The Mosquito Lagoon, Florida, covers more than 25,000 acres and lies within the borders of Canaveral National Seashore and the Merritt Island National Wildlife Refuge. The south end of the Mosquito Lagoon lies in the shadows of the Kennedy Space Center. Mosquito Lagoon fishing charters are minutes from New Smyrna Beach, Daytona Beach, and Orlando. Mosquito Lagoon lies under the protective eye of NASA and the United States Fish and Wildlife Service. The Lagoon is a glimpse of old Florida, with no hotels, condos, or buildings on the skyline. Palm trees, mangroves, spoil islands, and salt marsh dominate the landscape of Mosquito Lagoon. In addition to serving as home to many fish, the Lagoon area also has many dolphins, manatees, alligators, wading birds, migrating waterfowl, deer, wild hogs, otters, raccoons and more. Mosquito Lagoon Redfish are world famous. Anglers come from around the world to sight fish redfish in crystal clear water over the expansive shallow grass flats. Schools of Mosquito Lagoon redfish holding 100-300 fish are not uncommon with many others ranging from 30-75 redfish. Schools of bull redfish are the highlight of many Mosquito Lagoon redfish charters with trophy redfish measuring over 40 inches in length and weighing 20 plus pounds. 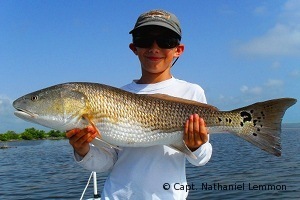 You can view the Photo Gallery to see pictures of trophy redfish. 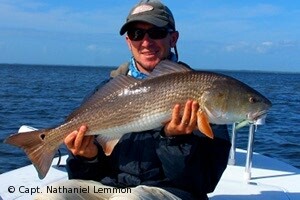 Fishing for redfish in Mosquito Lagoon occurs year round. Mosquito Lagoon Spotted Sea Trout are also a premier attraction. Speckled trout are the most abundant fish in the Mosquito Lagoon. Trophy speckled trout measure over 30 inches in length and weigh over 10 pounds. Numerous smaller speckled trout lie in deeper water and are easy targets for lure and live bait anglers. Resident Mosquito Lagoon Tarpon in the 5-40 pounds can be found throughout the year in the deeper waterways, ditches, creeks that run throughout the lagoon. During the summer, adult tarpon over 60 pounds filter in through Ponce Inlet and fill the area backwaters around New Smyrna and south into Mosquito Lagoon. On Tarpon fishing charters you will find rolling fish, laid up fish, and schooling fish. Because tidal flow is limited in much of the lower portions of Mosquito Lagoon, Snook aren't as abundant on the flats. Snook are routinely caught however in and around deeper waterways that run throughout the Mosquito Lagoon. The further north you go towards New Smyrna Beach and Ponce Inlet, the more numerous snook become. The average snook that one may come across on a Mosquito lagoon fishing charter is 1-10 pounds. Sight Fishing Mosquito Lagoon is the highlight of most fishing charters. Expansive grass and mud flats with little structure allow light tackle anglers to use light lines and a variety of lures and live bait. Poling skiffs like the BT Vengeance that run shallow and draft little water are a necessity to access much of the lagoon fishing grounds. Mosquito Lagoon Fly Fishing is highly popular because of the Lagoons clear water and the ability that gives anglers to cast to their targets. Fly fisherman find success casting shrimp, crab, and baitfish patterns on 6-10wt outfits. There are many Mosquito Lagoon fishing guides, very few, however, are true full-time professionals. Capt. Nathaniel Lemmon is a pro angler and guide, working no other jobs and spending every day on the water fishing, scouting, running charters, or product testing. Read his monthly updated Mosquito Lagoon fishing reports for all areas of Mosquito Lagoon, including the north end all the way to New Smyrna Beach and Ponce Inlet. Mosquito Lagoon fishing trips are only minutes from Daytona Beach, New Smyrna Beach and Orlando. Mosquito Lagoon fishing charters with Capt. 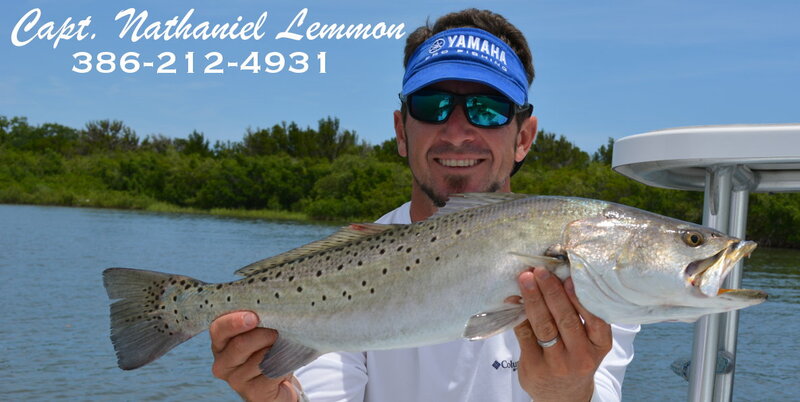 Nathaniel Lemmon originates from any of the launch locations located along the borders of the Lagoon. For visitors staying in New Smyrna Beach who wish to fish Mosquito Lagoon, you can be picked up at Canaveral National Seashore or JB's Restaurant.